Colliepoo Borderdoodle Puppies. 1 Boy 1 Girl Left! Adorable bundles of fluffy fun. Home reared and very much loved family pets!! My fantastic KC reg Border collie has given birth to 7 stunning babies. They are tri coloured and beguining to get a fab curly coat just like their dad!! 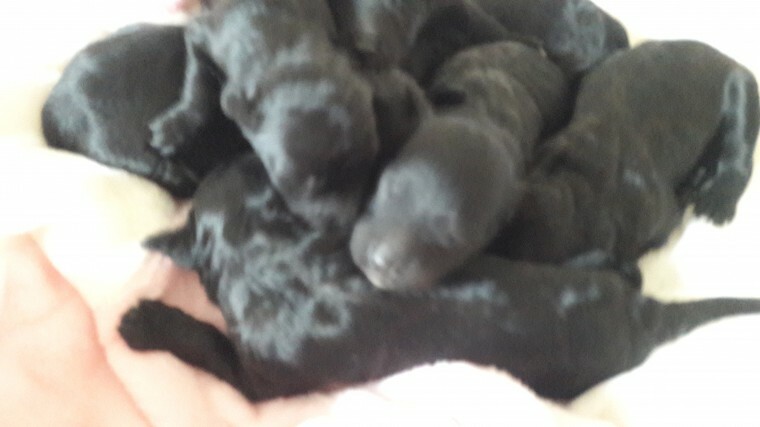 Dad is a KC reg miniture poodle who is PRA clear this means our babies are heriditory free from blindness. This truly is a fab mix of the worlds most intellegent dog breeds. These puppies will be easy to train, loyal and make fabulous agility dogs in the future. Both breeds are ideal for family's and with the poodle coat would be perfect for allergy sufferers and people like me who love border collies but not their molting!! Brought up in the home and very well socialised. Used to children and house hold goings on. My babies leave us wormed and flea treated to date. Microchipped vet checked and with their first injections. I also supply food and blankets to ensure they settle in their new homes as well as they can. We are taking viewings from the 17th of January. 100 deposit secures the puppy of your choice. For any more info please get in touch.